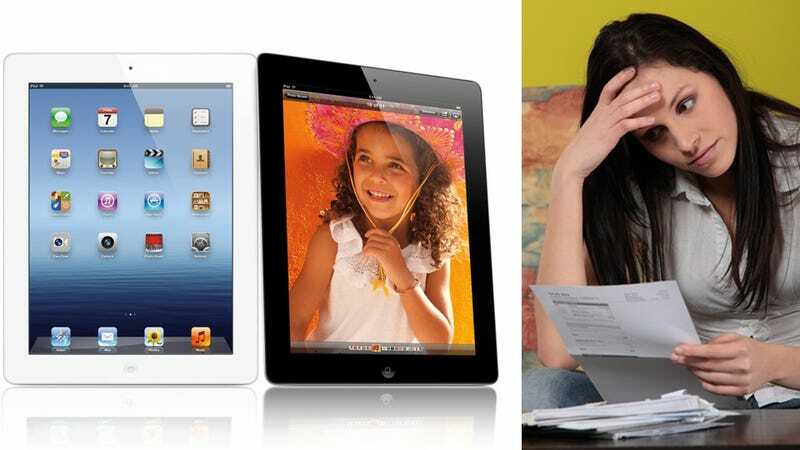 The new iPad, with its retina display and 4G LTE connectivity, is about to do wonders for your personal entertainment needs. But that much pretty at those speeds could also decimate your data cap. Why? Because nicer visuals means bigger file sizes. Here's how to limit the damage to your wallet. What's that mean? In order for an iPad app to become 'retina ready', it would potentially need to double in file size to include better assets, bigger icons, etc. Mo' pixels, mo' (data) problems. And when those downloads happen over the iPad HD's 4G LTE connection (where everything is fast fast faster), you'll be slurping down more data than ever before. A nationwide speed test showed AT&T phones averaged download speeds of 1995 kb/s on 3G and 13,175 kb/s on LTE. Phones on the Verizon network averaged 1131 kb/s and 10,153 kb/s downloads for 3G and 4G networks, respectively. And apps are just the start of it. Both AT&T and Verizon measure a variety of factors when estimating your data usage—including how many emails you send, the type of attachments they have, the number of videos you watch and stream, and the number of images you transfer in a day. But let's be honest, the iPad HD's Retina display won't suddenly make you fire off a slew of emails (just. look. at. those. fonts.) or download a new music collection just for the jacket art. No, you're going to use the iPad HD for sweet-looking HD apps and streaming clearer than real life video. According to AT&T, the average App/Game that's downloaded from the App Store and across its network is 4MB—which, if Panzarino is to be believed, means the average app size would double in size to 8MB with retina-quality graphics. AT&T also estimates that one hour of YouTube standard video takes 120MB to stream, while one hour of Netflix streaming uses 306MB. Luckily, AT&T estimates the data usage for both its 3G and 4G speeds to remain constant. Next, let's assume that you download 10 apps a month, watch 10 hours of Netflix streaming, and 5 hours of YouTube. Verizon, on the other hand, differentiates its estimate for 3G and 4G users, so a heavy streaming video user on 4G LTE will definitely notice an uptick in their data usage compared to their 3G usage. Verizon estimates a non-retina app/game download at 7MB, 3G streaming video at 250MB/hour and 4G streaming video at 350MB/hour. That's a huge jump in data usage from the iPad 2 to the iPad HD, significant enough Verizon 4G videophiles will definitely need to keep a closer eye on their data levels than their AT&T counterparts. Every bit of data used is more money squeezed from your pockets. Keep in mind, too, that AT&T 4G plans max out at 5GB/month, and Verizon at 10GB/month. Anything over that and you're on the hook for some hefty overage charges. Remember, this data usage estimate doesn't account for browsing the web or sending e-mails, so your data usage will likely be even higher than your estimate. And if you're an iCloud user, or heavy Pandora or Spotify streamer, you're going to want to take that into consideration as well. The moral of the story though? Even though 4G LTE is spanking fast and the retina display is drop dead gorgeous, try to use Wi-Fi as much as possible, especially when streaming video or downloading apps to avoid clearing AT&T and Verizon's data caps. UPDATE: According to an Electronista report, Verizon will offer 4G LTE data plans in 3GB, 5GB, and 10GB varieties for $30, $50, and $80, respectively. AT&T will also offer 3GB and 5GB plans for $30 and $50, respectively, as well as a minuscule 250MB plan for $15—useful for those of you planning to use the New iPad primarily on Wi-Fi networks.